The dam at Jennings Randolph Lake impounds the North Branch Potomac about 10 miles upstream from Luke, and about 40 miles downstream of the Fairfax Stone. 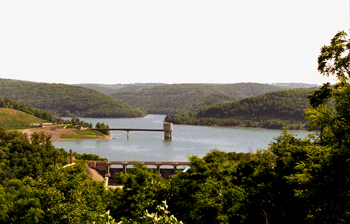 Originally named the Bloomington Dam and Lake, the project was renamed in 1987 to honor longtime West Virginia Senator Jennings Randolph, who had a major interest in water resources projects nationwide. The dam is 330 feet high, made of rock and stone quarried nearby. The U.S. Army Corps of Engineers built the dam beginning in 1973. It took more than a decade to complete. Water from the lake is drawn into several intakes, depending on the quality and quantity of water available. The water is used mainly for water supply in the Washington area (200 miles downstream) and for flood control in the Upper Potomac. Another major purpose of the dam is to improve the water quality of the North Branch Potomac. Water draining into the lake comes from an area with a large number of abandoned coal mines. Drainage from the mines, which is high in sulfur, creates acidic conditions that are harmful to fish. As the acid water enters the lake, it settles into layers. Reservoir managers can select the best water for release to the North Branch to improve water quality downstream. Water quality improvement in the North Branch has been a major success story in the Upper Potomac in the past decade. Before the dam was built, the North Branch at this point had virtually no aquatic life. In recent years, the river has been able to support a trout fishery. The National Oceanic and Atmospheric Administration (NOAA) has an on-line river forecast service summarized below. Click on the Web link below for detailed NOAA data on the level of the Jennings Randolph Dam. The U.S. Geological Survey (USGS) has a streamflow monitor on the North Branch Potomac at the Jennings Randolph Reservoir. For detailed current information on river flow, select this link.